picture of underwater world in Indian ocean, Comores Islands. Frog fish. Rare fish with great mimicry. Here on the reef has the same red color. The unusual appearance of the frogfish is designed to conceal it from predators and sometimes to mimic a potential meal to its prey. In ethology, the study of animal behavior, this is known as aggressive mimicry. Their unusual shape, color, and skin textures disguise frogfish. 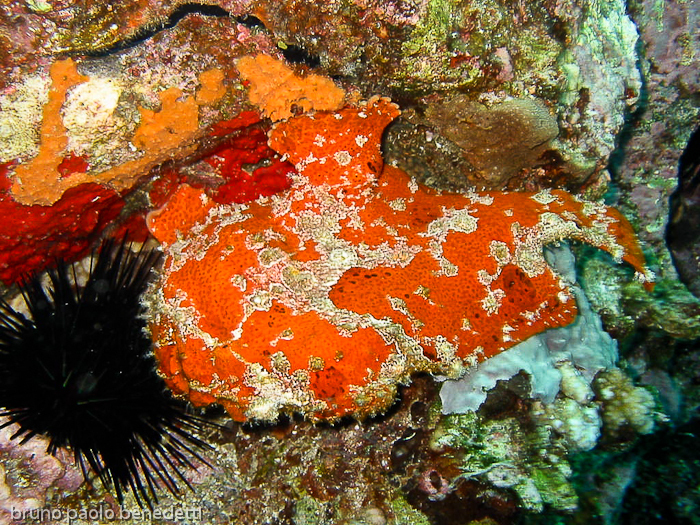 Some resemble stones or coral while others imitate sponges, or sea squirts with dark splotches instead of holes. In 2005, a species was discovered, the striated frogfish, that mimics a sea urchin while the sargassumfish is colored to blend in with the surrounding sargassum.Some frogfish are covered with algae or hydrozoa. Their camouflage can be so perfect, that sea slugs have been known to crawl over the fish without recognizing them.Picture taken from high side.